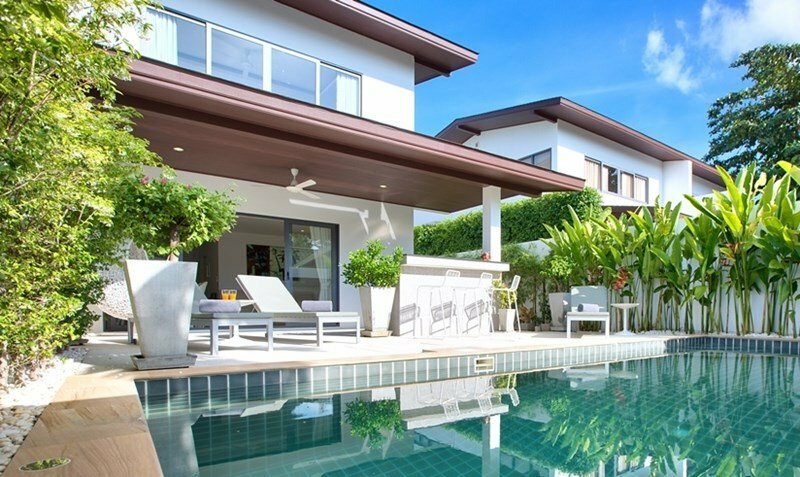 This stunning 2 storey modern, contemporary villa, 3 bedrooms, 3 baths, (sleeps 6 maximum), private swimming pool ((3m x 6m) and outdoor living area and bar, is Ideal for large families and friends to make memories last a lifetime. 3 Bedrooms, sleeps 6 comfortably. Each bedroom is completed with contemporary matching furniture, individually selected art, dressing tables and wardrobes. All linens and towels are supplied. 1 King-size Bed, Built-in Electronic Safe, ceiling fan and air conditioning, en-suite bathroom with twin wash basins and bath. Twin Single Beds, ceiling fan, air conditioning and en-suite bathroom with rain shower. 1 King-size Bed, ceiling fan and air conditioning. Separate bathroom with rain shower.